A 19-year old driving a Mercedes-Benz C-Class rammed into a Maruti Swift on Saturday. The youth driving the Mercedes-Benz was allegedly drunk and was trying to avoid traffic check post in Delhi. No lives were lost due to the accident. 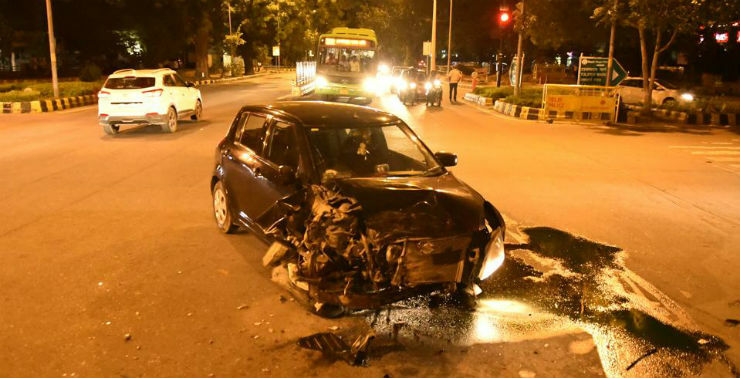 The accident took place at Kasturba Gandhi Marg in Central Delhi on late Saturday night. The 19-year old driver, identified as Dhruv Bagla, was accompanied by a 20-year old friend Karan Jain on the night of the accident. The duo was coming from Connaught Place after a drinking session. The car was signalled to stop by a police picket on KG Marg. The C-Class first slowed down and then sped away at the first opportunity. The accident happened at a traffic signal placed less than a 100 metre from the check post. The duo tried to jump a red light to escape the cops when a Maruti Suzuki coming from the other side rammed into the vehicle. After the crash, the Mercedes-Benz lost control and climbed on the side pavement and hit a signboard before coming to a halt. The accused driver Dhruv Bagla was arrested at the scene but was later granted bail. The medical tests on Bagla and his friend confirmed that they were drunk at the time of the accident. Bagla is the son of a car dealer. The occupants of the Mercedes-Benz were not injured as all the airbags in the vehicle were deployed, saving the duo instead of high-speed crash. The driver of the Maruti Swift received grave injuries, but according to the cops, he is out of danger and is currently admitted to a hospital. The driver of the Swift was the chauffeur of Ajay Agarwal, a former director general of Tihar Jail. Numerous accidents on the Indian road cause due to overspeeding and drunk driving. The Indian roads and the infrastructure are not safe enough to handle high-speeds. Here are a few tips that can protect you on the road. Influence of alcohol can affect your decision making capability. Never drive under the influence of alcohol.